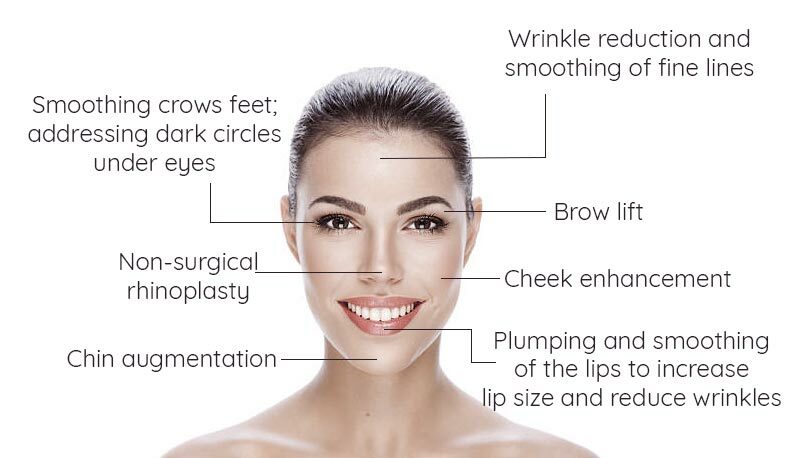 Dermal fillers are tiny injections that reduce the appearance of fine lines, sagging and signs of age by filling in areas under the skin to promote volume, “plumping” and smoothing. The key ingredient is a sugar gel that is completely safe. It is able to combine with water and swell when in gel form, causing a smoothing/filling effect. In fact, it occurs naturally in your body. We use the market leading brand that has been thoroughly tested for safety and efficacy. This gel contained in dermal fillers actually encourages the production of collagen in the skin leading to a more youthful appearance. Restoring a youthful complexion by replacing or enhancing volume and giving shape to your face. Results can be visible instantly and the effect typically lasts for between 6 and 12 months..